It is the twenty-second of December; the day after the winter solstice. The sun rose at 8.05am and will set at 3.53pm, and the moon is full. A ‘Full Cold Moon’ or ‘Long Nights Moon’ according to my dependable almanac, which also lists the daily sea temperatures around the coast, all the dates of the spring and neap tides, snippets of folklore and helpful suggestions of seasonal jobs to do in the garden. I am not at the garden, having been grounded by a bout of the nastiest cold virus I’ve had for years. I am writing to you from beside the fire wrapped in thick knitwear, with Mavis at my feet. Jess is, though, and sends me field notes by text; she’s finishing a few last-minute jobs before Christmas, putting in raspberry canes and naturalising wood anemones around the shed. It has been a beautiful, clear, cold day. Just past half three and dusk is already settling over the hills. We’ve been tinkering away at the garden jobs over the last couple of months. There’s still plenty more to do - there’s always more to do (help needed! - more on this at the end of this post) but we’ve crossed off planting all the new plants in the perennial beds, including miscanthus, pampas and panicum grasses, ferns, hellebores, Japanese anemones, echinacea and scabiosa. In the tunnels green shoots are already peeking through the dark soil - alliums, thousands of ranunculus and anemones. The nigella, larkspur and agrostemma seedlings are doing well, sown back in September for our ‘19 brides. I’ve always enjoyed the sense of ceremony and ritual to these few days before Christmas. They seem to contain a particularly intoxicating alchemy: candle flames in darkness, ice and incense, an equal measure of nostalgia and anticipation. 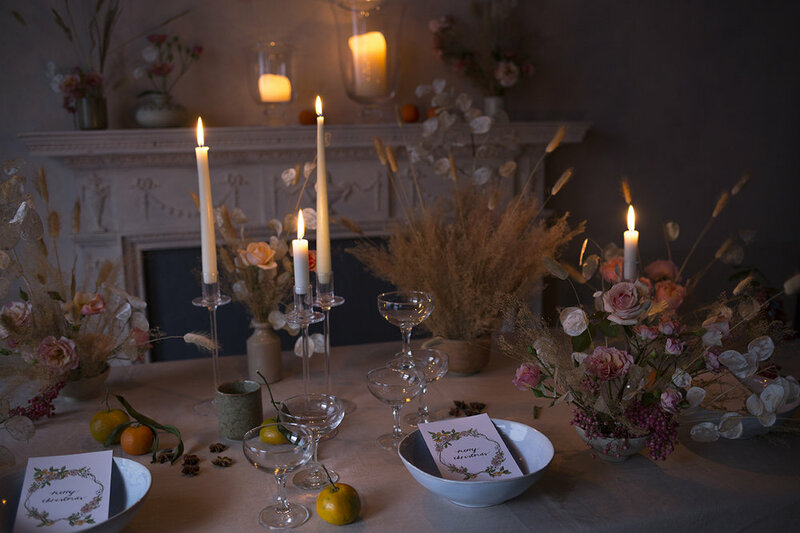 But unlike the rest of the year when we’re usually busy propelling ourselves forward, onto fresh experiences, new recipes, into the next season, at Christmas there is a romance to just standing still, and looking back, too. To doing things the way you always have - eating fish on Christmas Eve, filling silver bowls of golden-foiled chocolate coins, lighting a candle in the morning before you make your first pot of strong Italian coffee, wearing something shimmery in the evening. These simple, tactile acts - striking the match and holding it close to the wick until the flame catches, unwinding the lametta - the thin strips of sparkling silver metal to finish adorning the tree - hold deep significance. Though I am not a religious person, there is something sacred about them. They make you feel glad to be alive. The ‘magical’ atmosphere of Christmas must owe much to the folklore, fables and stories surrounding this time of the year. The nativity, the nutcracker, the thunder oak, Baboushka. I get carried away looking up the significance of plants associated with certain yuletide recipes and decorations - sage, ivy, poinsettia (which Mexicans call ‘The Flower of the Holy Night’, isn’t that beautiful?). I particularly love the Norse legend about mistletoe. It goes something like this…Frigga, the goddess of love, commanded every living being to swear an oath not to harm her son, Balder, the god of light and innocence. She mistakenly forgot to include mistletoe and Loki, the malevolent god of evil and destruction seized an opportunity, creating a deadly arrow from a sprig of mistletoe, with which to murder Balder. Upon his death the world was plunged into darkness - supposedly the reason that nights in the Northern hemisphere are so long. Frigga wept for her son, her tears turning into white berries, but she vowed that mistletoe would never again be used for evil; instead becoming a symbol of love and peace. Music too, of course. Carols and hymns, the spine-tingling sound of a male Welsh choir. The chaste and haunting Russian Orthodox chanting of Divna Ljubojevic - S Nami Bog and Slavoslovije - Statije. Yo-Yo Ma and Alison Krauss’ rendition of The Wexford Carol. Judy Garland crooning Have Yourself a Merry Little Christmas (so unforgettably slipping off that heavily encrusted glass-white headscarf). My favourites are the Ukranian Carol of the Bells and the King’s College Cambridge choir singing In the Bleak Midwinter. When I was thirteen, in my last year of prep school, I sang the solo verse of Once in Royal David’s City at Salisbury Cathedral. High in a stone turret beside the organ pipes I’ll never forget the sheer terror and elation of hearing my voice leave my throat, filling the ancient cloisters where people have worshipped for over seven hundred years, imagining the hundreds of people in the congregation far below, listening. My voice, amplified by the cavernous stone space, became its own entity, like a ghost floating high above the transept and along the naves. It was one of the loneliest experiences of my life. And yet, oddly, there was a sense of power within it too. A sense of conquering my own very mortal limits - my fear, my size, my strength. Singing can do that - make you feel immortal. To this day, whenever I hear that solo my blood runs cold. Tomorrow night, even if I’ve partially lost my voice to this lergy, I’m going to drag myself out up to Marble Hill and sing carols by candlelight, in the comforting knowledge that my notes will join the chorus of others; that I won’t be heard. If I stand beside my husband, I definitely won’t be heard. The last wedding of the year under our belts, we close the studio for our annual winter break. At home I hang a sprawling thyme wreath on our door and put a jug of mistletoe on the dining table beside a wooden bowl piled with oranges, walnuts and ribbon offcuts. I dress the tree (I take hours over this, dragging it out for as long as possible, unspiralling the lights, unwrapping the glass baubles and polishing them each with a soft cloth). A crate full of ornaments are then hung from the prickly branches - the etched glass and crackled-blue baubles, Swedish straw wreaths, angels and stars, metallic cloth bags of dried lavender that we made with Mum one Christmas when we were kids, tiny brass acorns on emerald ribbon. The next few weeks will be a chance to rest and recuperate. It has been a long year and we’ve given everything to it. Energy-wise I feel as though I’m running on empty (reserving the last of it for hosting Christmas lunch), but conversely my heart is brim full. This is how the rhythm of our year goes - full throttle April to Christmas, and then a lull. But we need the lull - its good to step away for a bit and get some perspective, and one of the benefits of running a seasonal business is that we can. There’s a lot of travel for us next year. Jess is off to India for a month in the New Year, then we’re heading to Japan in March, teaching in South Korea in April and hopefully Northern Italy too, later in the summer. So we’ll have plenty of distance and perspective in 2019, which will undoubtedly do us, and Aesme, the world of good. We haven’t travelled much for the last four years - too busy getting the business up and running - so to get to travel for work, meet like-minds and find fresh inspiration along the way, well it’s a dream come true. I’m working out our movements in Japan and having never been before would love any recommendations for Tokyo and Kyoto - if you’ve been or live there and know any great spots to eat, stay or gardens to visit will you email them to me or send a DM? We’d be so grateful for any insider tips! 2019 is going to be another beautiful, crazy adventure, I can feel it. For a while Aesme will be dormant, in repose, waiting. Then there will be snowdrops and hellebores and the first narcissi and from March we’ll be chugging along again, business as usual. Our Flower School workshops at the studio April to October 2019 are all scheduled; tickets and further details are available here. We are looking for two people to join our team next year from April onwards - a part-time gardener for Hampshire and an assistant florist to work with us at the studio in London. We’ll be posting details of both positions early in the New Year so if you might be interested, or know someone who might be interested, please watch out for our advertisements on Instagram and on the website. Thank you to every one of our readers, clients, students, freelancers, helpers, friends and family for your support and encouragement this year. Every comment, DM and email is so much appreciated and we can’t wait to bring you more from our growing garden and studio in 2019! Wishing you all a very Happy Christmas and a prosperous New Year.